On this page you can share some of our sporting successes with us. 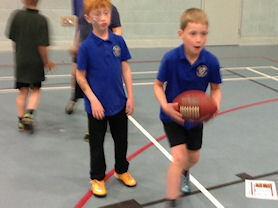 A group of Year 5/6 children represented the school at a Kingsbury basketball competition. The children worked together to show great team work (which improved as the children took part in more games), passion and determination. It was obvious that the children had a deep sense of respect for both themselves and others, especially at the end of games when they congratulated their opponents. Our running club members in festive mood. Our committed lunchtime running club have been building their strength, pace and endurance over the last term. 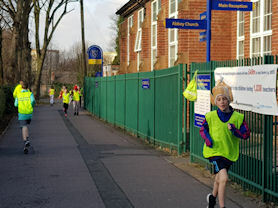 Pupils run on the road, on the school drive and take part in games supported by staff and parent volunteers. Our last session before Christmas saw us playing Christmas themed fitness games, with novelty hats of course! 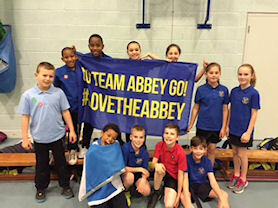 On Monday 12th November, our Abbey hockey team returned to Kingsbury SSP for their final. The children showed excellent teamwork, using our Abbey Values to lead the way. 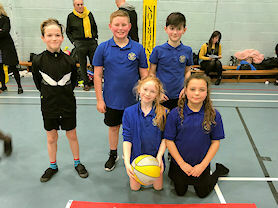 The children went up against some challenging teams, but with perseverance and pure determination behind them, they improved throughout their games and finished the competition in third place. On 23rd October 2018 we took part in an inter school gymnastics competition organised by Kingsbury School Sports Partnership. Our gymnastics team joined nine other schools to show off their fabulous vaulting skills and floor routines. 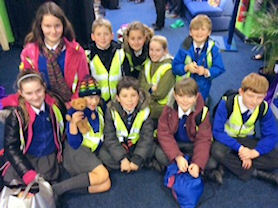 Pupils from all schools were incredibly well behaved and demonstrated excellent attitudes. Thanks to Mrs K who had supported the children in the after school gymnastics club. 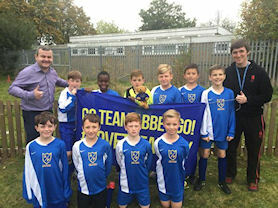 On 25th September 2018 the Abbey Catholic Primary School were taken to Yardley Primary School to compete in two football matches. When we got there our first match was against Timberley. Abbey started brightly and secured a 2-0 lead at half time. In the second half Abbey continued to thrive and managed to score another goal making it 3-0. Timberley got a goal back to make it 3-1 the shortly after Abbey scored once again to secure the win. In the last two minutes Timberley got another goal, then the final whistle blew. A great performance by Abbey. Abbey were faced by Yardley in their second fixture, a repeat fixture from Finals day 2018. Abbey started strongly again making it 2-0 but just before half time Yardley scraped a goal back making it 2-1 at half time. Yardley kicked off the second half but were intercepted by the Abbey, who countered and made it 3-1. Straight away Abbey used their striking force and scored again! Yardley held their heads high and managed to score in the last five minutes but not enough to beat the Abbey. The final score was 4-2 to the Abbey. Overall it was a strong start to the season and we hope to continue our winning streak! Our Year 4 sports stars. On Monday 17th September 2018, a team of Year 4 children attended the yearly Multi Skills Competition as part of Kingsbury School Sports Partnership. All the children were really excited and keen to take part in a variety of activities that could demonstrate their skill in agility and team work. There were a number of different exercise stations that the children had to take part in for a timed amount - ranging from how many rugby passes they could do as a team to the ball boy challenge and dribbling skills. Everyone that took part had a great time and team work shone throughout! A great result as The Abbey finished second earning silver certificates. Thank you to all involved! 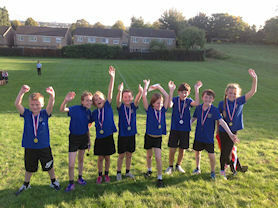 On Thursday 13th September, a selection of children from KS2 took part in a cross country competition. The children faced an intense course, which included hill sprints and a path through the woods. It was an winding 1300m course, that left children exhausted after they had pushed themselves to their limits. 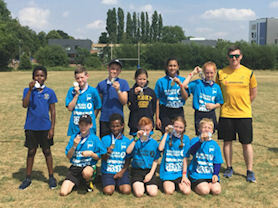 On Friday 13th July the Tag Rugby team represented Kingsbury at the level 3 competition at King Edwards, Edgbaston. 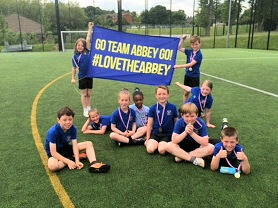 This was only the second time in recent years that the Abbey tag rugby team have been grouped in a competition with the very best teams across the whole of Birmingham. The Abbey started the group stages well with the great performances winning every match. In the semi-final, they came across St Mary’s who took an early lead. The team stayed very resilient not giving up at any point clawing their way back into the match showing their teamwork, skills and speed resulting in them winning the match 6-2. This resulted in the playing St Joseph’s, Kings Norton, a team that have previously beaten the Abbey in another competition. During the final, both teams demonstrated fantastic values with the game going right to the wire. Unfortunately, St Joseph’s still proved to be just too strong eventually winning 7-5. This was a fantastic achievement being crowned the second best team rugby team in the whole a Birmingham. The best ever finish by an Abbey team. Well done! With 30 seconds to go of a remarkable play-off evening at the end of a remarkable season, the destiny of the ESPSFA League crown was still not known. 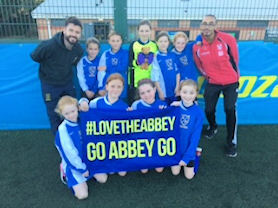 With Harper Bell anxiously looking on, Abbey – needing one more goal to retain the title – launched a final attack against a Yardley side whose goal two minutes earlier had swung the championship in Bell’s favour. Abbey’s swift, ultimate move proved decisive and as the ball hit the net the title was theirs. 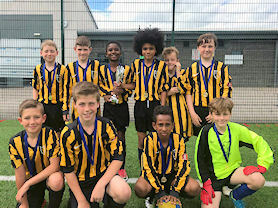 The play-offs had an unfamiliar look as only three schools competed – Brownmead’s no show meant it was a shoot-out between Abbey, Harper Bell and Yardley Youths at the CTC Kingshurst. With each side to play each other in a round-robin format, Harper Bell, the Premier champs took on La Liga runners-up Yardley, in the opening game. Both sides started tentatively, feeling each other out in an even first five minutes. The game changed when an unfortunate Youths defender, in trying to clear a cross, deflected the ball past his own goalkeeper and into the top of the net. A second goal quickly followed and a third, midway through the second half, saw Bell run out 3-0 winners. Bell were back in action moments later as they took on La Liga, and reigning ESPSFA champions, Abbey. The tempo of the game was quicker with both sides keen to gain an early advantage, but neither goal was breeched and an absorbing ten-minute half ended goal-less. At the start of the second stanza, Abbey forced a number of corners and from one, hit to the far post, a free header put them one up. Bell responded brilliantly and forcefully hit back at the champions. Their positivity was rewarded with an equaliser four minutes from full-time. Despite chances coming and going in the final few minutes, neither side could add to the scoring. Bell would have to await the outcome of the final game of the season, Abbey vs the Youths. A 3-0 Abbey win would draw them level with Bell on the night, anymore and they would be champs again. Knowing they needed goals, the black and yellows went straight at the Youths and raced into a 2-0 lead; before half-time it was 3-0. Yardley, with pride at stake, came out a different animal in the second half and began to exert some pressure of their own. Abbey’s ‘keeper came bravely out of goal twice to thwart the Youths but eventually Yardley had their goal – smartly taken from their strong striker. Moments later, and with time ticking away, the same player saw a sharp shot hit the outside of the post and Abbey had survived another scare. And so to the season’s defining moment and that goal, 30 seconds from time, meant Abbey’s 4-1 win was enough – just – to seal back-to-back ESPSFA League titles. 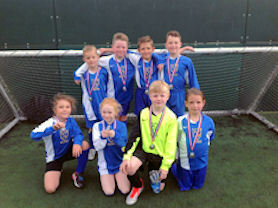 A team of mainly Year 5 pupils competed today at Wast Hills training facility for a 7-a-side football tournament. A strong start led to a 2-0 lead but some defensive lapses resulted in a disappointing 2-2 draw in our first fixture. 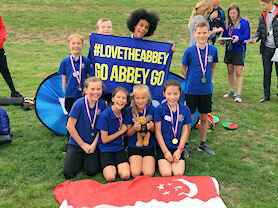 In true summer tournament style a group stage of three matches finished with Abbey on seven points following two consecutive wins. 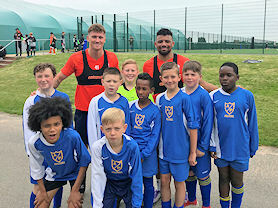 A quick lunch and a cameo appearance from Birmingham City’s Isaac Vassell and Dann Scarr were followed by our semi-final. Unfortunately two early defensive lapses put Abbey on the back foot and we never recovered loosing 3-2. Again the third/fourth placed play off started with more defensive mishaps however a late brace rescued a result and we ran out in joint third place. A fantastic day of sport had by all involved. On Friday 16th March, the Abbey Catholic Primary school Year 5/6 team played against Boldmere Junior in a HMS shield fixture. The Abbey were a player down due to illness, so knew there were in for a tough game and had to work hard. The game started evenly with goal opportunities from both teams. However, just before the half-time whistle Boldmere scored with a cracking volley. After half-time the Abbey fought back hoping to get an equaliser. Boldmere had several more shots and good runs that were dealt with by either Abbey's amazing defence or excellent saves from our 'keeper. The Abbey also had many good chances to score that only missed by a fraction or were dealt with by Boldmere. Unfortunately for the Abbey, Boldmere scored several more goals increasing their lead. The Abbey continued to fight back creating more and more promising chances and some good efforts. However, the final whistle was blown at a final score of 5-2 to Boldmere. 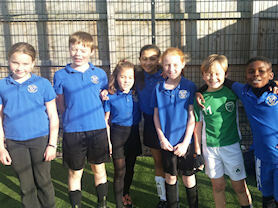 On Tuesday 13th March, the Abbey football team played two ESPSFA league matches. Our first game was against Gunter Primary school. We started with a strong line-up to make sure we go that first win. The game was dominated by the Abbey and we scored the first goal, the game went on and the goals kept on coming! The match finished with a hard defeat for Gunter, 8-0 to the Abbey. The Gunter lads never stopped fighting and were gracious in defeat. One win down, Audley to come. This was a much tighter match, Audley were a physical, but fair opponent, that gave the Abbey team no time on the ball. Audley took a deserved lead through a well worked head corner, as the half passed the entertainment was unreal! It was end to end constantly throughout the game. Minutes before half time the Abbey finally got a goal back. The second half carried on in the same way, and with time running out Abbey scored a crucial second. Audley didn't give up there thought, they battled till the very end, with Abbey's goalie making some crucial saves. Abbey caught Audley with a late break to make it 3-1 a score line that flattered us. In the end Abbey won both matches, 8-0 and 3-1 respectively. Hopefully we can get another two wins in our next round of league fixtures. Last week, on Monday 13th January, children from Years 5 and 6 took part in a basketball competition at St Edmund Campion. The team came fourth, in this intense but amusing tournament. Our team played like experts, completing complicated tackles, working as a team and darting around the pitch like dragonflies. They were all extremely active and although they didn't make it to the finals, the team had a fantastic time and were very proud of themselves. On Wednesday 29th November our squad of eight Year 3 and 4 boys competed in and won the Year 3 and 4 ESPSFA cup, for the third year running! The evening started with a hard-fought 1-1 draw against Audley Primary school. We took an early lead via Ethan’s wonder strike from his own half, Audley battled back and their hard, but fair, tackling made clearing the ball up field very difficult. Things took a huge improvement from their as Abbey won their following games 5-0 and 5-1 respectively to finish the group in second place, narrowly missing top spot on a difference of 2. The boys were delighted to hear they had made the quarter-finals of the competition, the game itself was perhaps the most difficult of the evening as an end-to-end affair finished with Abbey winning in the last minute with an excellent strike from Declan. The semi-finals were much more comfortable with Abbey running riot and winning 7-1 with many of the players chipping in with excellent finishes. The opponents in the final were well-known to our team as it was once again Audley, whom we had drawn in our first fixture. An inspiring team-talk from Mr McTernan, ensured that the team were ready for the tough, but fair tackling to come. The Abbey team met fire with fire and turned the tables on Audley with their own tough approach, this worked wonders as we demolished Audley’s unbeaten record with a 3-0 result. We give thanks to our God given talents which led to a wonderful evening of frosty, Autumnal success. On Tuesday 31st October, a team of ten Year 2 pupils attended a Multiskills competition at Erdington Academy along with seven teams from other schools. 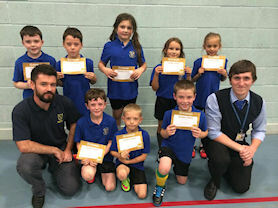 They took part in seven different skills based activities including an agility run, tunnel ball and football passes, alongside a bonus basketball game. Each activity only lasted for two minutes so they didn't have long to earn as many points as possible and the team had to work well together as well as encouraging them at all times. The whole team tried their very best and showed perseverance and enthusiasm throughout. After a busy hour and a half of competition, we were proud to hear that we had been placed 4th and the entire team received individual certificates of participation. On Tuesday 10th October two teams from Years 5 and 6 attended the annual Hockey competition at Erdington Academy. It was an extremely well attended competition with 33 teams having entered from over a dozen schools. 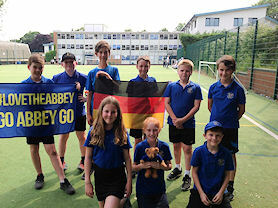 Both teams played several matches in the round robin stage and on completion of that, the Abbey were successful in securing a place into the semi-finals. After yet another nail biting match, the team earned their place into the final. This too was a great match to watch and the children fantastically won! Throughout all matches, the teams displayed great sportsmanship and determination. Well done to all involved - you worked really hard and did The Abbey proud! 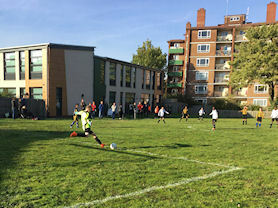 On Tuesday the 10th October, the Abbey football team played there 3rd and 4th league games of the season. We arrived halfway through the first game, which luckily we were not playing in. Once we arrived, we warmed up by running round the pitch and practised our attacking and defending. Our first game was against Saint Matthews. During the first 5 minutes we were dominating our opponents by pressing high up the pitch. It was a tight game but we finally found a perfect counter attack, which put us 1-0 up. In the final minutes of the game we got a lucky tap in. There was no time to rest because we were straight back on the pitch. Our opponents were better this time and more physical. We were playing against Hillstone school. In the first few minutes they had a few opportunities, but luckily they didn’t score any of them. Then we started to get our confidence in this match and got a few shots off. Then during a counter attack Hillstone were awarded a penalty’ which they scored. This put them 1-0 up and they managed to keep that one goal advantage and go on to win the game. Here’s to another exciting evening of Abbey football. On Tuesday 3rd October, a group of six Year 4 children attended Erdington Academy for their annual Gymnastics competition. It was a very well attended event with twelve schools having entered. On arrival, the children were able to practise their floor routines and vaults in readiness for the impending judging. When performing their individual floor routines and vaults, the children demonstrated their gymnastic skills of core strength, balance and technique. 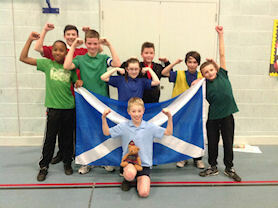 They all did a fantastic job and demonstrated all of the School Games qualities remarkably. After the judges had finalised their scores, we were delighted to learn that we received bronze medals - coming third in the competition! An enormous well done to all children involved for their hard work and commitment. On Tuesday 26th September the Abbey started their ESPSFA league campaign. We started the day with a hard fought match against St Bernadette’s, we took an lead before an unfortunate goalkeeping error lead to an immediate equaliser. The Abbey persevered and eventually won 3-1. There was no time for celebrations as we were straight back on the pitch to play another game against Timberley, which we also won 2-0, with Ethan getting the first clean sheet of the new season. All the players enjoyed the games and they all worked their hardest to win both games. Here’s to another successful season. On Thursday 14th September 2017, we took part in the very first competitive sporting event of the academic year. 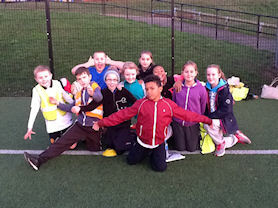 Pupils from Years 4 and 5 represented our school in the Kingsbury School Sports Partnership Cross Country competition. The runners gave a fabulous performance against several schools (including lots of Year 6 competitors). All team members gave their best efforts, were a credit to our school and their families and obtained participation certificates. Our Abbey boys turned on the style as they comprehensively beat all teams to the final. The attacking prowess of our offensive players stood out all evening as they consistently passed their way through teams and scored from all over the pitch. Abbey won all three group games before confidently dispatching teams in the quarterfinals and semifinals. The final began strongly as we immediately found the bottom corner after being passed the ball from kick-off. Audley equalised immediately as we struggled to deal with their in-your-face approach to closing down our players. We then repeated our trick of a long range finish but Audley deservedly fought to a 4-2 victory. The boys were devastated but all that watched were extremely proud and impressed with their run to the final. On Monday 19th June, a team of Year 5/6 pupils from The Abbey attended the KSSP Rounders Competition held at St Edmund Campion. Despite it being an extremely hot and humid afternoon, all children worked well together as a team - showing their collaborative and perseverance skills. In total, the team played five 20 minute matches that involved both batting and fielding, scoring numerous rounders and half rounders - which demonstrated their throwing and catching skills. After many tense and close matches, the results revealed that The Abbey came third, securing a bronze medal each. Well done to all children involved - super team work! 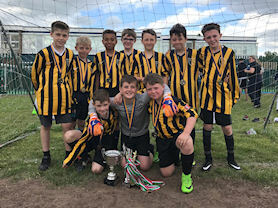 The Abbey's football season continues to reap its rewards as the ESPSFA league season rounded off with an Abbey League and Association double. Having sealed the league title a few weeks ago with a record of 1 draw (our opening fixture) and 9 straight wins. The Abbey went into the finals day full of confidence. Our semi-final saw us play Harper Bell, many of our boys recognised their Manager as the District Manager, an insight that firmly put Mr McTernan and Mr McCaffery on the back foot. However their concerns were unfounded as half way through the first half we had a back post corner that was send flying into the top corner. All seemed well as the half drew to a close but an amazing turn of pace from the Harper Bell striker caught our goalie on the ball and having lost out, Harper Bell had the simple task of slotting the ball into an empty net. Half-time 1-1 and our keeper devastated, the boys rallied round and gave him the boost in confidence he needed. A few excellent saves more than made up for his error before a brace of goals and an immediate goal from our super sub saw Abbey through to the Final 4-2. On a scorching afternoon the boys took on fluids whilst news trickled through that our old enemy St Peter and Paul's had battled their way through in the other Semi-final. The final was a tense affair, the league meeting had been settled by a very late deflected winner 1-0 and Abbey had to hope for a similar in this game. Half time came and both teams had defended resolutely, 0-0 and all to play for. Mr McTernan and Mr McCaffery decided to stick with the line-up that had decimated Harper Bell in the second half and it reaped its rewards, with our team heading home a sumptuous cross to make it 1-0. It was immediate changes throughout as Abbey waited for our opportunity to hit Peter and Paul's on the counter. We duly obliged, and slotted the ball home to make it 2-0 and send the crowd of parents into raptures. A huge thank you to all who supported our boys throughout the season and to Mr Perkins of the Rosary for organising such a fabulous league. Abbey football is not over yet and various year bands are eying up some end of season cup silverware. 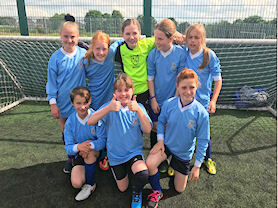 On Wednesday 14th June, the Year 5 and 6 girls football team competed in a North Birmingham schools football tournament. The girls finished in 4th place, and showed excellent passing and shooting skills. Some of our winning athletes. 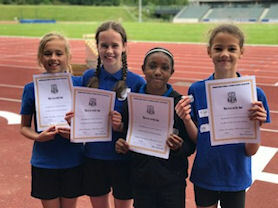 On 12th June 2017, Key Stage 2 pupils represented our school in the annual Birmingham Catholic Primary Partnership Athletics event at the Alexander Stadium. Our pupils did incredibly well, obtaining some personal bests as well as medals and certificates. There was great support from parents and staff. Particular thanks to Mrs Kennedy, who coordinated the entire event. A wonderful evening for Birmingham Catholic Primary Schools. Year 5 and 6 pupils had a fun afternoon in the glorious sunshine taking part in the Tri Golf competition. A variety of different challenges and courses were completed, with our team coming 4th. Thank you to the St Edmund Campion YA leaders and KSSP for such a well organised event. 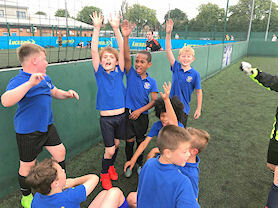 On Saturday 20th May, boys from Years 4 to 6 represented the school in a 5-a-side competition. The high-intensity competition saw lots of skilful, end-to-end football which saw the strong Abbey team finish runners up in their group therefore qualifying for the semi final of the competition facing the winners of the other group, Meadows. The semi final was an incredible close affair resulting in the Abbey unfortunately losing 1-0. Well done and thank you all the boys who gave up their Saturday morning to represent the school. A special thank you to Mrs O'Rourke who very kindly gave up her time to supervise the event! 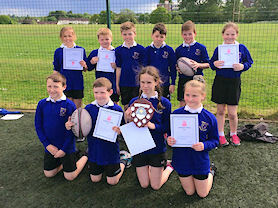 On Friday 19th May a total of 14 schools took part in this years BCSSA Tag Rugby competition - the biggest the competition has been for many years. Team were split into four different groups which were all fiercely competitive with teams taking points off each other. After concluding the group stages, it prevailed that the semi finals would be fought out between The Abbey, St Joseph’s (Kings Norton), Holy Cross and reigning champions, St Catherine of Siena. The first semi-final saw The Abbey and St Joseph’s compete in a very tight encounter which eventually had to be settled with two minutes extra time. Although this extra time continued to show some excellent end-to-end rugby, The Abbey eventually managed to sneak in for the winning try- final score 9-8. The final showed a real high level of skill, speed and communication from both teams. The first half was a very even encounter, but as fatigue set in, the composure of St Catherine of Siena’s attack saw them stretch away eventually winning 13-7 thus retaining their title. Well done to all the children who represented their school brilliant as well as achieving the highest finish in the competition for 7 years! Our Year 6 tennis players. 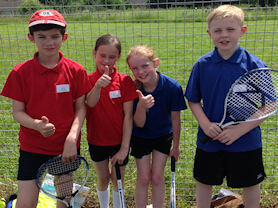 On Thursday 18th May, a team of Year 6 children attended the annual Kingsbury SSP Tennis competition. The team arrived at the venue in the glorious sunshine and commenced their first pool of matches. Throughout, all players showed great determination - running after every ball and had some fantastic rallies. During the second pool of matches, the beautiful sunshine turned to torrential rain - but that didn't stop this resilient and determined group of children! They battled their way through the persistent rain and earned a place in the semi-finals. After four more exciting matches, they narrowly missed the finals but secured four bronze medal coming third in the competition A huge well done to the players involved. 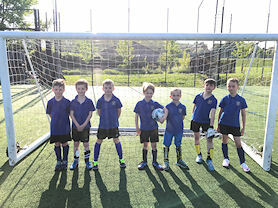 A squad of seven excited Year 2 boys got their first taste of competitive school football. A beautiful early summer's evening entertained a Year 2 5-a-side competition at Erdington Academy. Our boys equipped themselves brilliantly scoring 16 goals without reply in 4 group matches. The final was a much tighter spectacle and the Abbey were narrowly beaten in the final. The boys despaired but all adults involved were extremely proud of how they performed throughout the evening of football. Things point to a continued run of success for Abbey football. On the 9th May 2017 our cross country team joined other Catholic Primary Schools in the Birmingham Catholic Schools Sports annual cross country event. We were welcomed at the Priory school and are very proud of our team success. As well as two of our team coming second and third overall in the girls event, the whole team were awarded aggregate winners for the third year running. 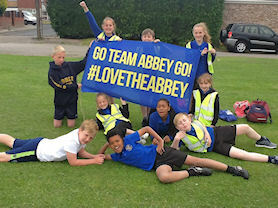 On Tuesday 2nd May the Abbey football team competed against Waverley in football. As the game started, we got the ball and pushed straight up the pitch for Joshua H to get the first goal. As the game went on, we were unlucky with some of our chances as Josh hit the side netting with a shot. As the game went on the Abbey dominated the game scoring four more goals in the first half courtesy of goals from James, Will, Dan and Patrick. The second half continued in a similar manner with the Abbey clearly in charge scoring a further four goals due to some fantastic team play. Second half goals came from Josh, Kane, James and Dan resulting in a final score of 9-0 when the whistle blew. Thanks to Mr McTernan for supporting the children with this event. Some of our great tennis players. 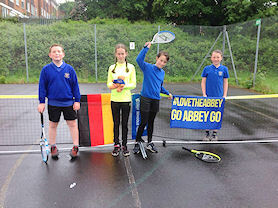 On Thursday 27th April 2017, three teams of children represented The Abbey at the KSSP's annual Year 3/4 Tennis competition. In total, there were over 15 schools taking part. All the children were really excited and couldn't wait to get started! Everyone that took part showed great sportsmanship and ran after every ball - showing their skill and passion. All three of The Abbey teams secured their way to the semi-finals where the children once again competed superbly in their matches. Fantastically, we then made it through to the finals and after some tense moments, we won the tournament - securing gold and bronze medals! Thank you to all that took part - we are really proud of you. We can't wait now to represent the partnership at the forthcoming Level 1 Games in Birmingham in July 2017! 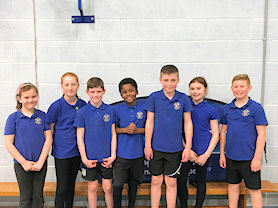 After last year's success in the Erdington schools Swimming competition, eight members of the Sports council were invited to compete against seven other schools in the local area. 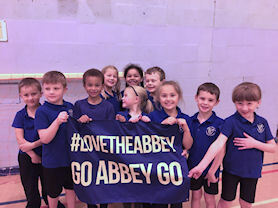 Every swimmer showed resilience and determination, and the Abbey came home with five golds, two silvers and five bronzes, finishing in 1st place! We now look forward to entering the regional finals, which last year was held in Rugby. Year 1 competing at the multi-skills event. On the 16th January 2017, ten students from Year 1 attended St. Edmund Campion Secondary school to compete in a Multiskills event, lead by Kingsbury school sports partnership. Children were involved in various activities including: throwing and catching, running, jumping and bowling. They represented the school superbly showing great determination and resilience to complete the tasks given throughout which lead them to finishing sixth place overall. Members of the hockey team. This week our Hockey Team took part in a tournament at Erdington Academy with the Kingsbury Sports Partnership. Seven children represented the school from Years 5 and 6 playing against against eleven other local schools. The team played well together and we came fourth overall in the tournament. A great afternoon. On a rainy afternoon at Sandwell Academy, our girls' football team played some excellent football. After topping the group with three wins and a loss, Abbey made the quarter finals. A dominant quarter final game almost took a horrific turn when, against the run of play, the opponents equalised from a corner with the last kick. Our keeper held her nerve during the shoot out, saving the second penalty, before Jenny scored the decisive third. The semi-finals brought disappointment when two late goals resulted in a 2-0 loss for the Abbey. However we left with our heads held high when we won the third place play-off with goals from Lauren and Jenny. 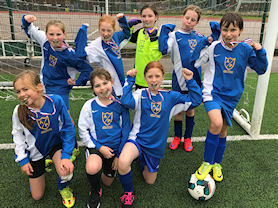 The season is shaping up nicely for the Abbey Catholic Primary girls' football team. Members of our football squad. 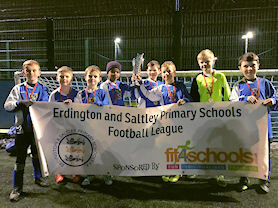 Abbey Primary opened their Erdington and Saltley Primary Schools Football Association (ESPSFA) season with two positive results against strong opposition. In the opening fixture against Yardley Primary, a team with a 100% record so far, Abbey fell behind to a low strike just after half time. Much could be said about the glaring sun affecting the keepers vision at this point but our boys battled on and Dan P, one of three footballing debutantes this evening, bundled home a scrappy corner to equalise. Dan P then twice went close to winning the game, a backwards header producing the save of the game from Yardley's keeper. In the end a 1-1 draw was an excellent result all round. Our second fixture of the evening against Mapledene (current league leaders) Abbey showed some real class. Dan P was again at hand to bundle home a fumbled back pass, a feat that ended with Dan leaving the field injured but also as leading scorer! Abbey didn't let this minor set back deter them and even though Mapledene equalised early in the second half, via an unfortunate own-goal, Abbey showed some real class to run out 4-1 winners. Josh re-established the lead with an excellent run onto the end of the Keepers pass forward before Aidan put the game to bed with a rasping finish and a curling corner that the keeper unfortunately turned into his own net. A fantastic evening all round! The boys were a credit to the school and whilst changes are afoot for the next fixture the squad is shaping up nicely for a successful season. On Thursday 6th October 2016, a group of Year 3/4 boys and girls attended a 5 a side football competition as part of Kingsbury School Partnership. The competition was held at Goals in Perry Barr and numerous schools from Birmingham took part. The children from the Abbey played really well as a team in all their initial matches showing great team effort, determination and skill. Having won all their matches - they qualified for the semi-final. This match again was played with true sporting spirit and excellent effort from all team players which rewarded them into the final! After an immensely tight and gripping final, Abbey received silver medals in the competition and were amazing runners-up. On Wednesday 5th October 2016 our Year 3 and 4 Girls Football Team played together for the first time. 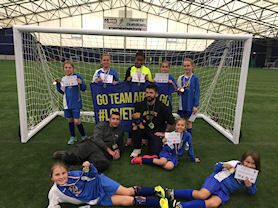 We were very proud to be a part of a brand new Girls Football league. All teams played very well and the true sportsman spirit was strong. Our team won one out of our three matches. Well done to all pupils, staff and parents who supported the evening. Year 5 and 6 runners. On 27th September 2016 the Abbey Cross Country Team from Years 5 and 6 joined other schools across the Kingsbury Schools Sports Association to compete in the annual Cross Country event. The Abbey team were very well supported by family members and represented our school tremendously well. Individual boys placed second and fourth overall whilst individual girls placed first and second overall. Each member of the team performed superbly well with girls and boys teams coming home with Gold overall medals. Huge thanks to Father Kieran who blessed both teams before departure-we're sure it helped! Thank you to Mr Jones, Mrs Hughes and Ms Tallon for supporting the event. Thank you to Ms Cope, Mrs Hughes, Mrs Lonergan, Mrs O'Rourke and Ms Tallon who support running club each week. The school football season got underway this evening with a Year 5/4 football festival organised on behalf of the ESPSFA. 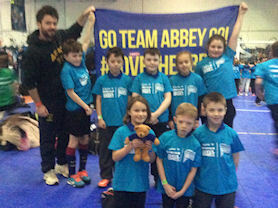 The Abbey competed brilliantly throughout winning their group without conceding a goal. The semi-final was a closer game with Abbey maintaining a well earned four goal lead to avoid a potential come back, winning 6-2. Abbey played brilliantly in the final particularly in the first half where they could have easily taken the lead through two clear one-on-one chances. Mr McTernan's dreaded 'free-kick in the final' curse struck again late on when an excellent free kick from the opposition nestled into the top corner. Abbey rallied immediately but there was just no time to find the equaliser. Well done to St Peter and Paul's who left with the winners trophy. On Monday the 25th of April Year 5 and 6 went to Kingsbury School to take part in a series of rugby drills. The competition was judged on which team could demonstrate the true sporting values of rugby such as determination, teamwork and respect. Everyone represented the school brilliantly never giving up and showing a real positive attitude to all drills. Members of the Abbey's squad. 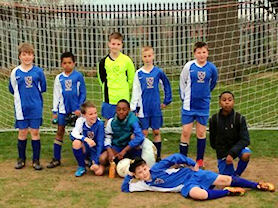 On 18th April six boys from Years 5 and 6 continued with the next three matches in the Saltley and Erdington League. The competition was at Sutton Town Football Club on Coles Lane. They took part in a mini league as there was four teams and they had to play the other three. They played Coppice at first and they drew 0-0 after dominating. Next, they drew 1-1 after a tight game with the other team. Lastly, they drew 1-1 in another tight game they all enjoyed it and were unlucky not to go through but still got a medal. Well done to all the players involved in the match. 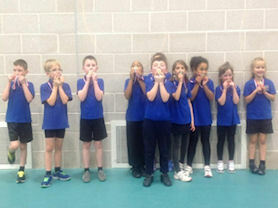 On Monday 29th February, a group of children from Year 4 went over to St Edmund Campion School to participate in an athletics competition. There were two other schools there that we were competing against. The competition involved demonstrating our skills in javelin throwing, sprinting, obstacle racing, hurdles and relay racing. 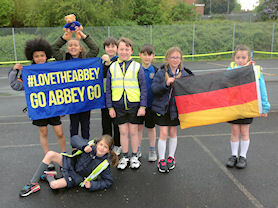 The Abbey children competed really well and even won some of the events! We were really anxious and excited when we sat down to receive the results but eventually we were told that we had finished in 1st place! We are now looking forward to the final. 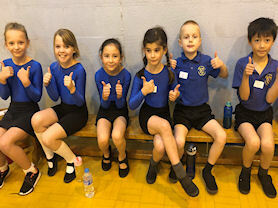 On Monday 25th January, Year 1 competed in their first competition against other schools. The competition involved demonstrating skills in catching, passing, kicking, running and throwing. They represented the school brilliantly showing great determination and resilience to complete the tasks given throughout which lead them to finishing fourth overall. Our basketball players in action. On Tuesday 12th January children from Years 5 and 6 went to St. Edmund Campion to take part in a basketball competition. We were split up into three teams. First was Abbey 1 against Glenmead. Abbey won in an exciting game. Next up was Abbey 3 against Featherstone. We started well with us going 1-0 up straightaway but Featherstone began to score and they beat us in another entertaining game. We kept taking it in turns to play everyone else in our group and last but not least, the results. So first was Pool A and in first place... Abbey 1! Next was Pool B and in first place... Featherstone! These two teams went on to play each other in a final at Stockland Green against other schools where the Abbey finished a valiant fourth. Our athletes waiting for the final result! On 17th November a group of Year 2 children travelled by minibus to Stockland Green to take part in a multi-skills final. They knew it would be harder than the first time but thanks to our parents and supporters we finished second in round 1. The scores were high in round 2 however the Abbey were trying their best and performed very well. They did all they could and then we were patiently waiting and …WE WON. A big thank you goes to all the children who took part in the competition as well as Mr Harris and Mrs Marks who supported us during both competitions. 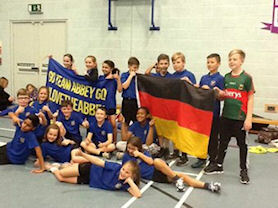 Abbey athletes ready for competition. On the 9th of November, the Abbey athletics team walked to St Edmund Campion for the athletics competition.We were competing against Kingsland A and B team, also Glenmead School from Great Barr. Miss Duggan and Miss Harnett came out of their way to cheer us and it helped us a lot. First we were competing in the field events including triple jump, long jump, chest pass, javelin and speed bounce. We excelled in all. Later that evening, we did the track events which we came first in all. Boys and girls competed in the obstacle where you roll, jump over hurdles and cones,crawl under holes then finally sprint back! It was then the relay races. The first was three laps with two people then two laps with three people. After that, two laps with two people. Finally, the four laps with four people one lap each. After singing our hearts out with The Abbey song, it was time for the results. In third place was Glenmead with 302 points. In second was us, The Abbey, with 303 points. And in first position was Kingsland with with 304 points - very close and very good competition. Thank you for inviting us, Campion! 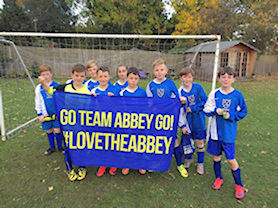 The Abbey Football team travelled to Saint Chad’s School for a Catholic Sports football match. It was the first Catholic Sports match of the season and we came up against some good opponents. We kicked off and straight away went on the counter attack where Lennon crossed it in and hit the post just missing out on a goal. St Chad’s crossed the ball and it came off one of our players and in goal so they were 1-0 up. A couple minutes later, they sadly scored another from a corner before half time. Right after the break, they scored again but it shouldn’t of counted due to a pass from Gerard to Joe to take the goal kick but they tackled Joe when he was given the ball to take it. When we restarted, the opposition went straight in right before the 2nd man had touched it and scored . The final whistle blew and we lost 4-0. Hopefully we can win our next match. The Abbey football team travelled to the Oval School in Whittington with some football banter on the way. We took kick off after having a bit of a warm up and sadly conceded the first goal. We took the ball after kicking off again and used the wings really well which gave us a goal before half time by Pharrele to be drawing 1-1 at half time. We really owned the second half after hitting the crossbar three times by Joe, Pharrelle and Josh then post twice by Joe and Pharrele. About 10 minutes until full time Josh crossed the ball into Pharrele once again and Josh actually scored after the keeper being too far out. We played very well and can't wait for the games to come this year and get our KFC for winning the title! 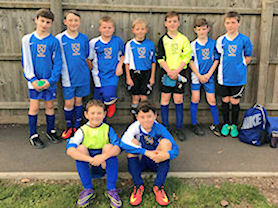 On Thursday 15th October we competed in the first two matches of the Erdington and Saltley primary schools’ football league. In our first match we won 2-0, thanks to some superb defending throughout and two great team goals. The second match proved trickier than expected due to some resilient defending from the opposition. The Abbey were able to prevail as winners thanks to a fantastic long range shot and a great cross which led to a headed goal. This was a great start from the team as it was the first time they had all played together, showing some quality team play whilst conducting themselves brilliantly throughout. The Abbey now sit joint top in the table with two games in hand. We look forward to our next group of matches! Thank you to all the staff that supported with the matches. 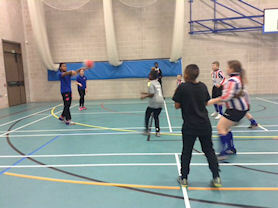 On Wednesday 14th October we entered the Sandwell academy girls 5-a-side football tournament. In our first match we won 4-0, thanks in part to a brilliant hat trick. The second match was a closer encounter which we won 2-0 in the final minute. We conceded our first and only goal of the tournament in a 1-1 draw which we equalised through a sublime free kick. We won the final group games 1-0 and 1-0, although our goalie had to make an outstanding stop from a penalty kick in the final match. We were very excited to reach the final against the team we had previously drew against. Whilst there was no separating us in normal time 0-0 we confidently took our penalties to win the final and the tournament 3-1. Our teachers and parents were very proud of us. 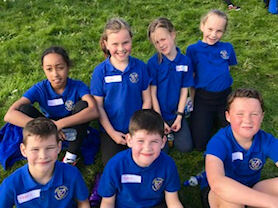 On Monday 28th September a team of eight children from Years 5 and 6 attended the first ever Kingsbury School Partnership's Cross Country Event. The sun was shining and there was an abundance of supporters - all there to encourage and support the competitors. Both races were really exciting to watch and sheer determination was always displayed on the faces of the Abbey children. All competitors performed brilliantly; demonstrating excellent passion and sportsmanship. We were totally delighted as we received first place in the girls' event and second place in the boys' race. On Monday 21st September 2015 a mixture of boys and girls entered the Kingsbury Multi Skills competition. We managed to enter two teams to compete at this event. Both teams tried extremely hard when competing in all the events. The events saw the children take part in throwing, football dribbling and agility exercises which they rotated around with their points being tallied. Through their great determination The Abbey finished 3rd and 4th and were an excellent representation to The Abbey School. A huge well done to all involved. On Monday 15th June 2015, a team of Year 4 and Year 3 children attended Kingsbury’s Tri Golf competition. The group of ten was divided into two groups of five to rotate around different Tri Golf stations and compete against six other schools. After the morning competition, The Abbey placed top of their group scoring an incredible 1300 points! It was a nail biting afternoon as The Abbey enjoyed Dodgeball and Hockey taster sessions whilst keeping an eye on the Tri Golf competition. 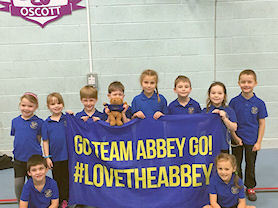 The Abbey finished in first place - winning gold medals and an opportunity to play in the Level 3 competition in July. On Monday 8th June 2015, a group of Year 5 and Year 6 students represented our school at a Rounders competition, which was hosted by St. Edmund Campion. All team members demonstrated great enthusiasm, enjoyment, good skills and excellent collaborative skills. We were pleased to be cheered on by our families and friends. The Abbey was placed third, narrowly missing out on second place. Well done to everyone, who represented the Abbey. Thank you to St. Edmund Campion for organising this event. Some of our Year 2 footballers represented our school in the Kingsbury Schools Primary Sports Partnership 5-a-side competition. In torrential weather these pupils won their group before being narrowly beaten in extra time of the final to run out as Silver medallists. Well done boys you did us proud! Our hardy running club members. Despite torrential downpours the attitude and perseverance of Abbey Running Club was tremendous during our recent, inter school, cross country competition. 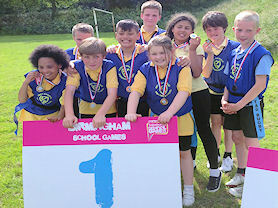 We joined eight other Catholic Primary Schools to compete in the Birmingham Catholic Primary Partnership annual race. All competitors performed brilliantly; demonstrating excellent sportsmanship. We were particularly delighted with second places in both the girls and boys races. Thanks go to our staff and parent coaches. Year 5 and 6 Tag Rugby players. 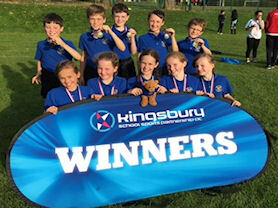 On Monday 27th April a select group of Year 5 and Year 6 took part in the Kingsbury tag rugby competition. With another ten teams present the Abbey were up against stiff competition from the very beginning. The team demonstrated great communication and defensive work throughout the group stages only conceding three tries in four matches. They finished top of the group with three wins and a draw meeting Kingston Primary School in the final. The final was closely contested between two very strong teams playing a quick and expansive style of rugby. With nothing separating the teams at the final whistle to competition was decided on a ‘golden try’. Despite the best efforts of the team, unfortunately the Abbey were beaten to the next try and finished second overall. A huge congratulations goes to all players in the team who represented the school magnificently whilst upholding the ethics of the game superbly. Well done! 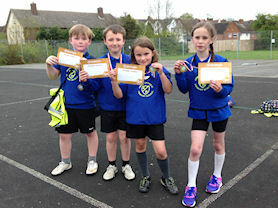 On Wednesday 22nd April 2015, a team of Year 4 children attended Kingsbury’s Tennis competition. They all tried extremely hard when competing in their individual matches and successfully managed to qualify for the final, having come top of their group. The final saw all four players play their best tennis, striving to reach every ball. 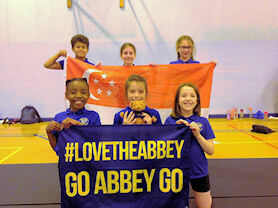 Their hard work and enthusiasm paid off as the Abbey finished in first place - winning gold medals and an opportunity to play in the Level 3 competition in July. 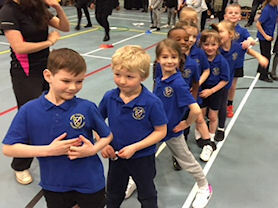 On Monday 23rd March a mixture of boys and girls from Year 1 and 2 participated in Kingsbury’s Indoor Athletics competition. They all tried extremely hard when competing in both individual and team events. The individual events saw the children take part in jumping and throwing events such as the javelin and the long jump. When all the individual events were completed the children collaborated to compete in a number of running events. Through their great determination to team finish second overall by one point! A great reflection of the effort put in whilst representing the Abbey. Well done! Year 3 and 4 at the Sainsbury's Games. 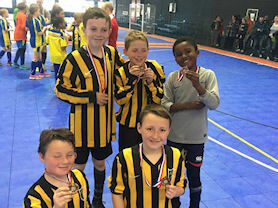 On Wednesday 11th February Year 3 and 4 went to the Sainsburys' Games Football Competition at Futsal Arena. They tried extremely hard and there five a side matches were memorising! After losing the first game Abbey went on to record two wins out of four in the group stages. They came through some very hard moments but persevered and reached their goal. There determination brought them a place in the quarter final. Hooray! Sadly, we lost in our match in the quarter finals 2-0 but we all knew it's the taking part that counts. We got to the quarter final so we are in the top eight of all the other 200+ schools in Birmingham. We would like to say well done to all the other schools who took part. Year 1 team members warming up. 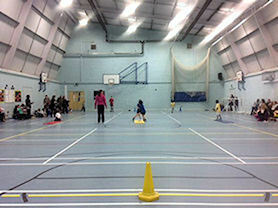 On 26th January, after school, there was a Kingsbury Sports Partnership multi skills competition for Year 1 pupils. When we arrived at St Edmund Campion Secondary School, Year 1 got ready to take on the challenge against other schools. Our media team also got ready to tweet - check on Twitter if you want to see them. Search #sportscouncil or #mediateam or #lovetheabbey. Year 1 students persevered extremely well; they paid attention to everything they needed to do and completed every task impeccably. At the end, Year 1 finished with over 100 points (128) . This means we came 5th overall. We would like to say well done to all the other schools who took part, especially Birches Green Infant School who came 1st. Thank you to all of our supporters and the Year 1 pupils who took part. Thank you to Mr C and Miss M who accompanied our Year 1 Multi Skills Team. Year 5 and 6 athletes. On 10th November 2014, fifteen children from Years 5 and 6 attended an Athletics event hosted by St. Edmund Campion. 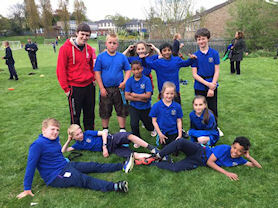 All children showed great perseverance and team work as they participated in a variety of athletic events including: javelin, chest-pass throws, long jump, triple jump, speed bounce and various relays. 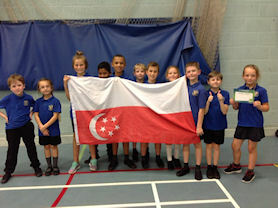 The children demonstrated encouragement and support for one another and competitors from other schools as they cheered everyone along and helped when required. With great pride, we watched as past Abbey pupils helped to support the running of this event. Everyone thoroughly enjoyed being part of this experience. The Abbey came fourth. Well done to everyone who represented the Abbey. Thank you to St. Edmund Campion for hosting this event. Year 5 and 6 entered two teams in the Kingsbury School Sports Partnership hockey tournament. During the first round of matches, both teams demonstrated skill, determination and great sportsmanship. Both teams progressed to the next round where they faced each other in the battle for the bronze medal. Thankfully, both teams maintained their sporting spirit. The result was 3rd and 4th place. The referee agreed that both teams were worthy of the bronze medal so all players received a bronze medal. Thank you Kingsbury School Sports Partnership for organising this event. Well done to everyone involved. 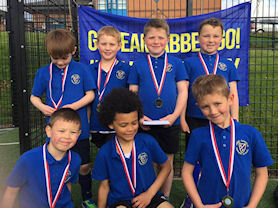 Our winning Y3/4 Football Squad. 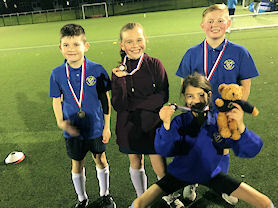 On Monday 6th October our Year 3/4 mixed football team competed in a tournament hosted at our local secondary school St Edmund Campion. A squad of eight children played brilliantly throughout the afternoon culminating in us reaching and winning the final. 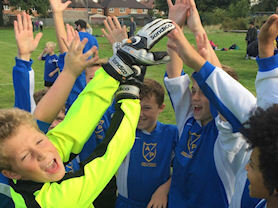 The children won their group without conceding a goal with three wins and a draw against some strong opposition. Things seems to take a turn for the worse in the final when the Abbey conceded and fell behind for the first time in the tournament. However one of our Year 3 strikers held their nerve to pull us level through a set piece, sending the team into extra time. Golden goals was the order of the day and our Goalkeeper ensured we remained in the competition with a brilliant point blank save. As time ticked away and penalties loomed a fantastic distance strike from one of our Year 4 players clinched a dramatic victory. All players were an absolute credit to the school, supporting each other and acting with dignity throughout victorious afternoon. Our runners in their funky socks! We were the only competitors not at secondary school and we are incredibly proud to share that out of 83 runners, all twelve of our team finished in the top 20! Within that, we also claimed second boy over the finish line and first girl. 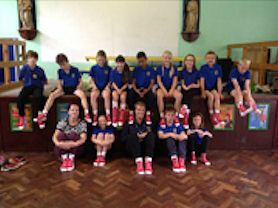 All Abbey competitors were presented with a pair of funky socks which they modelled proudly all day. Our coaches, Ms Tallon, Mrs Roberts and Mrs Lonergan are incredibly proud of all the running club. Watch this space for future achievements. Gold Award winners from Years 3 and 4. In 3rd place across the partnership were Years 1 and 2 with a bronze award. 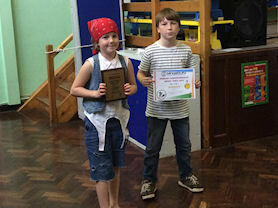 In 2nd place across the partnership were Years 5 and 6 with a silver award. In 1st place across the partnership were Years 3 and 4 with a gold award. Well done to all children who have taken part - this is a fantastic achievement and one of which we are very proud. Our winning Tag Rugby team. 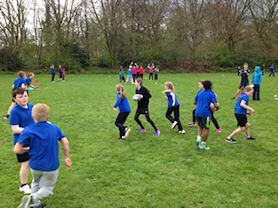 Year 5 and 6 children took part in the tag rugby competition, also at Kingsbury. After some intense training with Mr C, our team took 1st place in the Kingsbury School Sports Partnership, going on to become 4th in Birmingham schools - go tag rugby team! 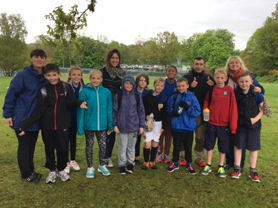 On Friday 13th June, boys and girls from Years 3 and 4 competed in the Tennis tournament at Kingsbury school and sports college. All children played extremely well and were only just knocked from 3rd place by Kingsland. Not to be disheartened though, we are ready to come back next year for 1st place! On Tuesday 13th May, boys and girls from our running club competed in the Birmingham Catholic Primary Partnership cross country race. The race was hosted by The Priory School and the course covered over a mile of cross country terrain. The rain didn't stop the enthusiasm of the competitors or spectators as teams came from all over Birmingham. All runners put in an excellent performance and we were proud to be joint aggregate winners. Thanks go to Ms Tallon and Ms Cope for supporting the event and to Mrs Roberts, Mrs Marks and Mrs Lonergan who support the children each week in their lunchtime training sessions. Even our parents are keeping fit and active, running the London Marathon for an amazing cause. 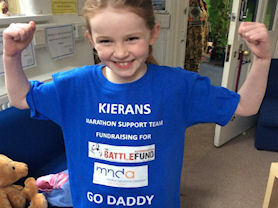 One of our pupils is proud to support her dad in the race. The long awaited game between St Thomas More and The Abbey finally got underway on the 17th March at John Henry Newman College, Chelmsley Wood. Following on from their 3-1 win in the last round, there was confidence amongst the players as the first half began. To begin, St Thomas More dominated possession with the Abbey holding back patiently; however, before long and after a few tactical changes, the Abbey found their feet and were comfortably in the lead at half time with a 2-0 score line. Having regained their composure with half time snacks of Jaffa Cakes, the buoyant mood amongst the plays continued well into the second half. Before long, and after stunning strikes from one of the Abbey's star strikers, the lead was extended to 4-0. Pulling together to ensure the team kept a clean sheet, the players worked hard to keep St Thomas More's at bay as they threw everything they had at the Abbey defence. The game finished a comfortable 4-0 and the Abbey are now ready to pit their wits against Our Lady of the Wayside in the Semi-Finals. 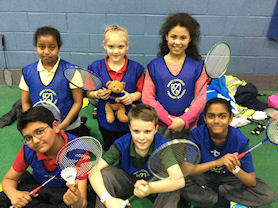 Well done to our badminton team who displayed excellent sportsmanship during the Catholic Schools Tournament on Friday 7th February 2014. The team got to play in the NIA sports hall and were a credit to school. Thank you to Miss Riisnaes and Mrs O'Grady for supporting the team. 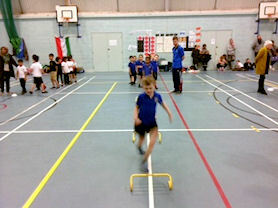 Ten children from Year 1 took part in a multi skills event at St Edmund Campion, against other schools from the area. 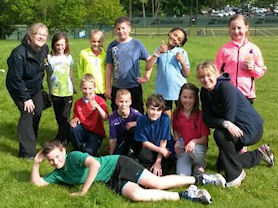 The children took part in various activities including hurdles, throwing and catching, and football passing. All children were a credit to the school and their skills shone through as they came third, being invited back to the finals next week. Well done Year 1. For the past six weeks of school, eight children from Years 5 and 6 have been coming along to after school basketball club to learn the basics of the game and practice together to work towards competing against other schools. Last week the team were invited to a boys and girls basketball tournament at St Edmund Campion. The Abbey were up against St Peter and Paul's. 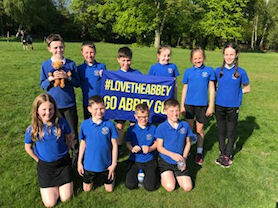 The children from the Abbey played as a team from the first whistle, passing the ball around, intercepting the opposition and talking to each other throughout. The game was extremely exciting to watch for everyone there and it was very close between both schools all the way to the end. We are very proud to say that after being two points behind with five minutes to go the Abbey perceived and worked together to produce a comeback and then go on to win the game. The victorious team now have a fabulous opportunity to compete in the Birmingham finals at the NIA. Year 5/6 Hockey team members. The Year 5 and 6 hockey team entered two teams into the Kingsbury School Sports Partnership hockey competition. The teams came 3rd and 5th. 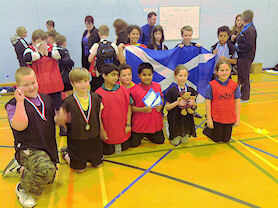 The children showed determination and great sportsmanship throughout the competition. Well done to everyone involved, they were a credit to our school. 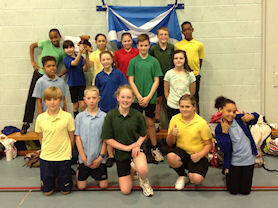 A mix of 15 children from Years 5 and 6 took part in the Athletics at St Edmund Campion this week. From the moment we left school, all children were a credit, listening carefully to and following instructions, as well as nominating each other for various activities including javelin, chest-pass throws, long jump, triple jump, and various relays. All children took part in activities and were not only supportive of their team mates, but also showed fantastic team spirit towards other schools and competitors - cheering on all participants. The result? A wonderful team with a wonderful result - first place and an invite to the finals on the 25th November. Well done to all who took part!